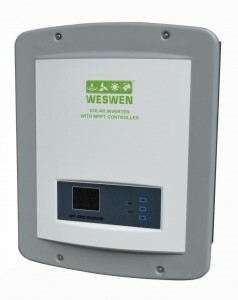 WF-series products are on the basis og green energy use and equipment electricity need for remote area, combing the electricity characteristics of household appliences, communication station equipment and computer peripheral equipment. They have the function of energy conversation and environment protection. They adopt MCU control technique, having various kinds of function such as multi-setting mode, MPPT control, voltage stbilization on line, short-circuit protection, inverter frequency adaptive, output overload, battery charging managment, monitoring etc. WF series products are the ideal power supply delivered with excellent performance, high stability, high reliability and high practical applicability.